Pasta in asparagus sauce is a smooth, silky and mild springtime meal. 1. Chop the asparagus into bite size pieces, reserve the tips. 2. Cook the chopped asparagus stalks in a little water in the microwave for 15 minutes on Max or until they are quite soft. Drain. 3. Transfer stalks into blender and puree until smooth. 4. Sauté the asparagus tips in butter and garlic for about 5 minutes. 5. Add the asparagus stalks puree, stir. 6. Stir in cream, season with salt and pepper. 7. Cook pasta in a lot of salty, boiling water according to manufacturer's instructions. Drain, but keep a little of the cooking water (3-4 tablespoons). 8. 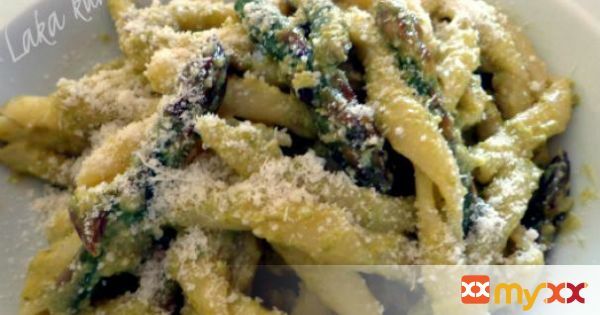 Mix pasta and asparagus sauce thoroughly and serve immediately sprinkled with Parmesan cheese.